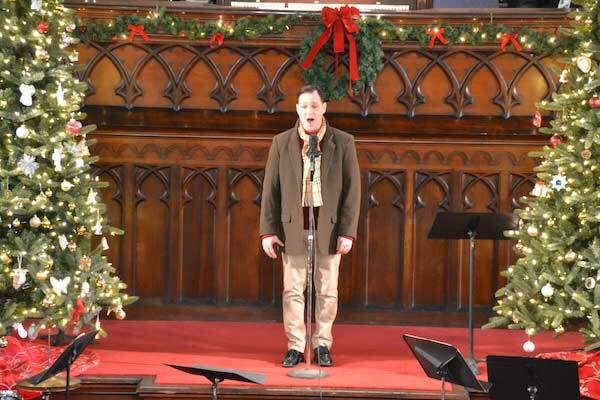 ALBION – Matthew Mooney, a 1993 Albion graduate, sings, “Thankful,” during today’s Christmas in the Neighborhood concert at the First Presbyterian Church of Albion. The concert included many Albion students, teachers and alumni. The concert is a benefit for the Albion Alumni Association which distributes about $87,000 annually in scholarships. Mooney is active in the Buffalo theater scene and is founder and artistic director of Buffalo Chrysalis Theatre. 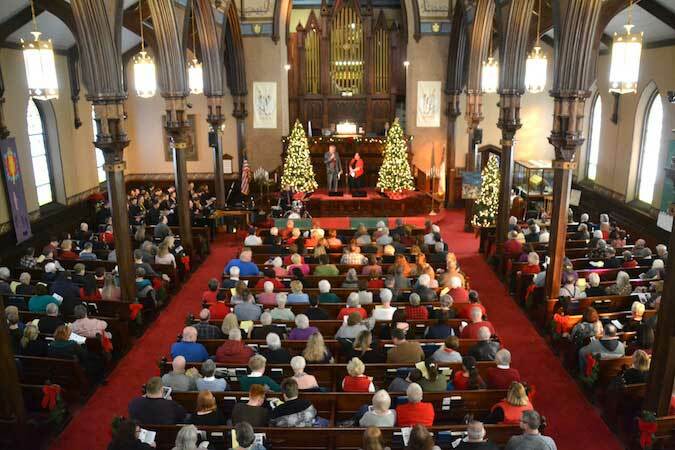 The crowd at the church is welcomed by Charlie Nesbitt, left, and Susan Thaine, pastor of the Presbyterian church and the concert organizer. 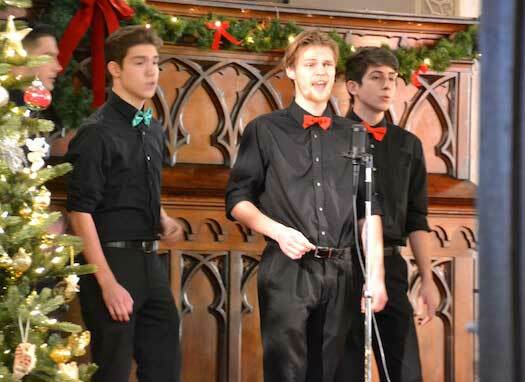 The Billies, a men’s a cappella vocal quartet of Albion High School seniors, sings, “Carol of the Bells.” From left includes: Evan Van Ameron, Jacob Ettinger, Enoch Martin and Nate Grammatico. 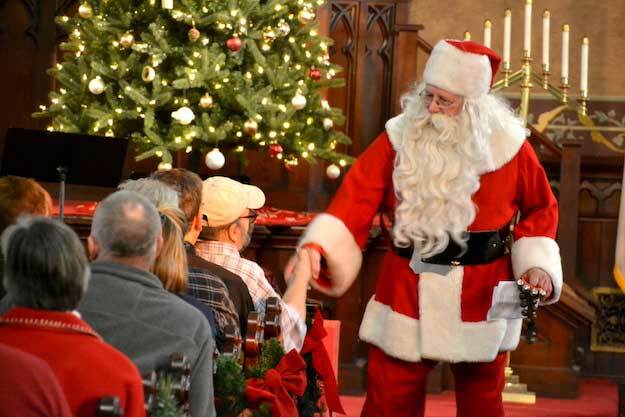 Santa went around the sanctuary shaking hands and wishing people a Merry Christmas. That was just before the crowd did a holiday singalong led by Alec Sherman. 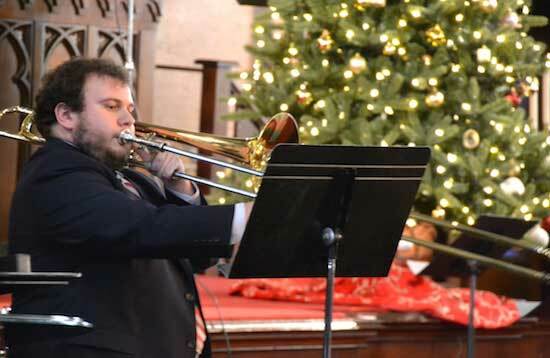 Joseph Condoluci, a 2012 Albion grad, plays, “All I want for Christmas is You.” He works as a substitute teacher and with the Albion Marching Band. 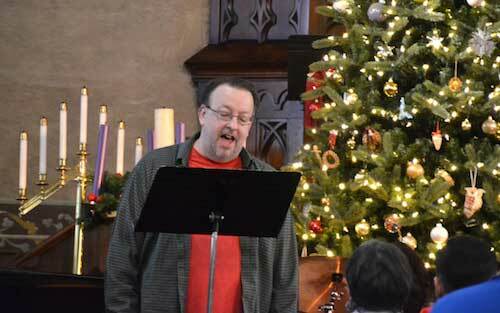 Lance Anderson, a 1983 Albion graduate, sings, “Have Yourself a Merry Little Christmas.” He is a private voice teacher and is very active with the local community theater group, the Lake Plains Players. 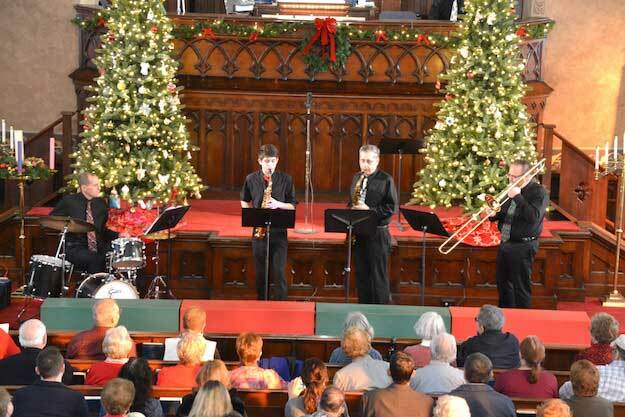 The Gramm Crackers performed “Funky Old Saint Nick.” The group includes from left Greg Martillotta, middle school band teacher; Nate Grammatico, an Albion High School senior; Michael Grammatico, retired Albion music teacher and Nate’s grandfather; and Mike Thaine, high school band teacher. Martillotta and Thaine are both Albion graduates. Other performers included: Angela Tarricone, AHS Trombone Choir, Shannon Vanderlaan, Scott Schmidt, Anna Atwater, Maarit Vaga, Aleka Schmidt, The Kingsmen, AHS Combined Select Choir, Lindsay Almeter, Sue Thaine and Gary Simboli.